When Yaakov was alone, the malach of Aisav fought with him and managed to injure him on the thigh. Chazal say that this blow went into effect during the time of the first “shmad” (assimilation) which took place during the period of the Chashmonaeem revolt. It was during the time of Chanukah when the Greeks strived to assimilate the Jewish People into embracing the Greek culture and religion. The sefarim bring proof to the pinpointing of this time period as such, by the fact that Yaakov fought this battle with Aisav’s angel when he returned to recover the פכים קטנים the small jars of oil that he left behind. Here can be found an allusion to the פך שמן of undefiled oil that was found during Chanukah possessing the seal of the Kohen Gadol. Another finger pointing to this time period is the injuring of Yaakov in his כף the exact opposite of the letters פך. This is as if to say that on Chanukah Am Yisrael were able to rectify the injury of Yaakov by the malach. To understand this connection on a deeper level let us first bring a fascinating detail of this fight between Yaakov and the angel of Aisev. Why did the Torah find in necessary to tell us the location where this battle took place מעבור יבק. The sefarim bring that it is to allude to the kedusha that we recite every day which can be found in the acronym of the letters יבק – ימלך ברוך קדוש. This teaches us that the essence of the battle that of realizing Hashem as the embodiment of these three levels. יבק is also the gematriah of two names of Hashem יהו’ אלהים . That would be sufficient hintings to testify that this place is not just a regular place. I would like to suggest yet another remez and that is that the wordמעבור means to pass, to pass over the letters of יבק and reach the next letter in the Alep Bais. After a yud comes a chaf (gematriah 20), after the letter bais comes a gimmel (3), and after the letter kuf comes a raish (200) altogether 223. The word בכר is also 223 including the word. This teaches us that the battle between Yaakov and Aisav’s angel concerned Yaakov’s taking of Aisav’s ברך to which only the בכר is entitled. There is still a deeper understanding of this battle which is revealed not by the letters in the word but rather by the omission of a letter. There are two types of eyes, one an outer eye and the other an inner eye. The inner eye is called the עין שכלי the intellectual eye. The passuk says Tehillim 104 24 מה רבו מעשיך ה’ כולם בחכמה עשית the creation is full of Hashem’s wisdom. When one observes the world with an עין שכלי he is able to peel back the veil of nature and discover Hashem as the sole sustainer of all life. This eye and world view is the trait and character of Yaakov Avinu and the Jewish Nation. The word שכלי is gematriah 360 which is ש”ס symbolizing the Torah Shebe’al Peh the Oral Law. It is through the toil of this Torah of Yaakov the יושב האהלים through which one’s eye looks at nature in a more penetrative look and finds Hashem. This is in contrast to Aisav who possesses the external eye which gets one excited about colors, hues, and the physical contours of objects and flesh. It is for this reason Aisav was called Edom – red, because of the episode where he just looked at the color of the red lentil soup avoiding the deeper look of its contents which were lentils that symbolized the death of Avraham that day. Aisav tried to convince his father that he too has an עין שכלי and that was why he deceived his father with halachic questions of how to tithe salt. That is why we find that in the first two letters of his name עש is also the acronym of עין שכלי . However, it was all deception for Aisav only possesses the external eye of nature. The inner eye of spirit is called a עין טוב which is gematria 147 the total number of Yaakov’s years of life. This is to teach that Yaakov embodied in his life time the עין שכלי the lens of Torah though which he saw the world. Aisav on the other hand possessed the עין רע which is the gematriah of ידי עשו. We find that sometimes a physical place can have an effect on a person’s actions and thoughts. For example the Ohr Chaim Hakadosh explains that as Avraham neared Mitzrayim he noticed Sara’s beauty and remarked about it. After these words came out of his mouth he was so taken aback that he even said them, and remarked why did I suddenly take notice of her beauty? It must be that the land of Mitzrayim is full of decadence and immorality for this is the reason their misdeeds are bringing impure thoughts into my mind. Rav Zusha said an that the effect that a place has an person can take place even if the people causing the effect are no longer there. The Chazal say that if two people are sitting together and there is no Torah being shared between them, then their place has become a Moshav Leitzim a place of cynics. Rav Zusha explained this statement to mean that our Chachamim ask how is it possible for two Yidden to sit together and not discuss Torah together? The only answer could be that this place must have been previously a meeting place for cynics and the effect of their cynicism still actively remains there. The name יבק also alludes to a negative energy that resided there whereupon the malach of Aisav felt was at this place specifically is the one most vulnerable for Yaakov to be defeated. The goal of the malach of Aisav was to knock out the עין שכליof Yaakov leaving him with only an external “fleishikdike” one. The Keli Yakar writes that this is why the passuk describes the battle between the two in the terms of ויאבק which literally means dust. That when one feels that he is about to overpowered by his opponent he might use the tactic of throwing dust into the eyes of his adversary thereby blinding him. Aisav was attempting to blind Yaakov from his spiritual eye. Him and all his 400 cohorts who came to attack Yaakov possessed the 400 gematriah of עין רע. This is the reason why the name of the angel of Aisav is סמאל which are the letters of לסמא to blind. So I ask you what better place other thanיבק , can one feel more secure in his success of this mission to remove the spiritual eye of Yaakov. For by examining the name יבק we will discover that it contains all the letters of יעקב except the letter ע. Bingo! Even the place יבק will support the success in Yaakov’s ע eye removal. The results of Yaakov’s battle with Aisav’s angel reared its head during the Chashmonaeem period. The galus of Yavan is compared to darkness. In darkness one cannot see clearly. Not enough that this world in general is likened to darkness, in Galus Yavon they brought about an even darker blindness. They made decrees to remove the עין השכלי from the Yid. The decree not to learn Torah was intended for this purpose. The Greeks understood very well that the learning of Torah can penetrate even the darkest of the dark. הקול קל יעקב. In the Torah the second word of קול is spelled without the letter vov. It is the gematriah of 130. The word עין is also the same gematria. It is through the קול of Torah that one strengthens the עין שכלי to perceive the world through the lens of Hashem and not nature. The עין יעקב (Devarim 33,28) is acquired by Yaakov’s Toras Emes the ע (70) symbolizing the seventy פנים to understanding the Torah. 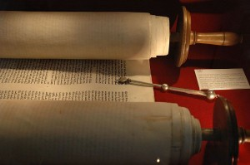 When one attaches Torah to his vision which is symbolized by adding the letter מ corresponding to the 40 days it was transmitted to Moshe Rabbeinu on Har Sinai (see Baal Haturim Parshas Terumah on the word תרומה תורה – מ, also the first letter of the first Mishna is the letter מ from the word מאימתי, and the last letter is also a מ from the wordשלום ) he then merits that his עין will be preceded by מcomposing the word מעין, source, a fountain. In other words, his eyes become the caliber of an עין שכלי ורוחני to see the source of creation, Hashem. Am Yisrael during Chanukah were up against such adversity. The Chashmonaim clung to the lights of the Torah symbolized by the lights of the Menorah in the Bais Hamikdash and by connecting to the source of nature which is Hashem. This is the reason why by our victory over the Greeks the first avodah in the Beis Hamikdash was to light the Menorah. It is the Menorah which symbolized the Torah Shebe’al Peh which lends a Yid the capability to see the inner light of creation rather than its external landscape. There is a special beracha instituted by our Chachamim concerning the mitzvah of Ner Chanukah which we don’t find by any other mitzvah. When one sees someone else’s Ner Chanukah in the street he should say a beracha ofשעשה נסים. Just by seeing alone, one is able to make a beracha of Al Hanissim. The reason being because the entire miracle of Chanukah is that Am Yisrael remained with the eyes of the inner light, the עין שכלי, gleaned from the light of the Torah Shebe’al Peh. In summary, when the malach of Aisav fought with Yaakov, he was out to blind his עין שכלי. The effect of that injury was revealed and aggravated during the Chanukah period. At יבק, the injury to Yaakov was on his כף. At Chanukah this injury translated into the Greek decree forbidding us to learn Torah Shebe’al Peh which is the command ofבפיך (in your mouth) gematriah יבק as it is written (Shmos 13,9) למען תהיה תורת ה’ בפיך . It was on Chanukah that we turned the כף injury into theפך victory of miraculously discovering the undefiled oil for the Menorah. The victory of Chanukah was led by Mattisyahu the כהן גדולwhich is gematriah 118. Yaakov’s injury which corresponded to the Chanukah, was at theמעבור יבק location which means to pass over(מעבר) the numbers of יבק . This can be translated to mean that after 10 there is 11, after 2 there is 3, after 100 is 101 = קיה 115, then adding the three letters = 118. It was Mattisyahu and his children who brought about the victory of Chanukah, the victory of the spiritual eye of Torah over the physical fleshy eye that focuses on nature. What we have found is that the story of Chanukah was already hinted in the battle between Yaakov and Aisav’s malach. The nameישראל which we were given after the battle has two meanings, means straight (ישר) seeing and visionשור בראשית מט כב רש”י)) of אל. As we are approaching the Yom Tov of Chanukah let us take on the resolve change to our corrective lenses and put on those that see through nature formulated by our increased dedication to Torah and its learning. NextJoin the Chanuka Telethon hosted by Rivka Malka and Benzion Klatzko!